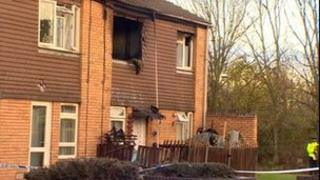 Police investigating a fatal flat fire in Worcester have arrested four people. Andrew Heath, aged 52, was found dead at his flat in Chedworth Close, Warndon, after a suspected arson attack on 14 December. West Mercia Police said two men, aged 19 and 24, and 17-year-old girl had been arrested in Warndon and a 16-year-old girl arrested in Malvern. Police said Mr Heath had become trapped in his flat after a fire was started in a wheelie bin pushed into the porch. Police said two of the people were being questioned at Castle Street Police Station in Worcester and the other two had been taken to Kidderminster Police Station. Det Ch Insp Paul Williamson said the investigation into Mr Heath's death "is still very much in full swing". He said a team of 40 officers and staff were working on the investigation. A £10,000 reward has previously been offered by police. Last month, officers appealed for information on the BBC's Crimewatch about a group of people seen outside Mr Heath's house before the fire in the early hours of 14 December. Two men were arrested and released on bail in December and another man was questioned and released on bail in January. Mr Williamson described the fire as "a personal attack".